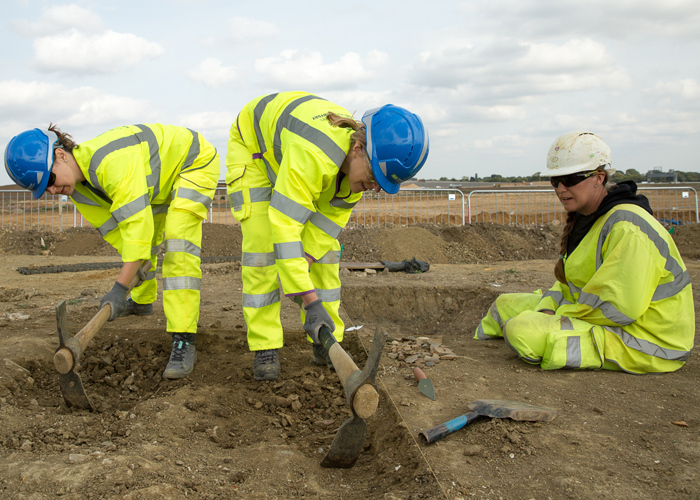 I’d been closely following progress on the A14 Cambridge to Huntingdon Improvement Scheme when I stumbled across the archaeology updates on the MOLA Headland Infrastructure blog. Fast forward to a local Time Truck event, where I got to see some of the amazing finds first hand (including a Roman Medusa Amulet), and my interest my interest in archaeology was well and truly sparked. When I learned that volunteers were being invited to help excavate the remains of the abandoned medieval village of Houghton, I couldn’t sign up fast enough for A14C2H Summer Community Dig. As Head of Digital in a busy agency in London, I wanted to reconnect with my local community and to undertake a bit of a digital detox! As much as I love what I do, I was craving an adventure and the outdoors. Having had no previous experience of archaeology I wasn’t sure what would be involved, but I liked the idea of throwing myself into the unknown, and learning something entirely new from MOLA Headland’s expert archaeologists. One of the first things I had to get used to was being kitted up in full PPE or personal protection equipment! 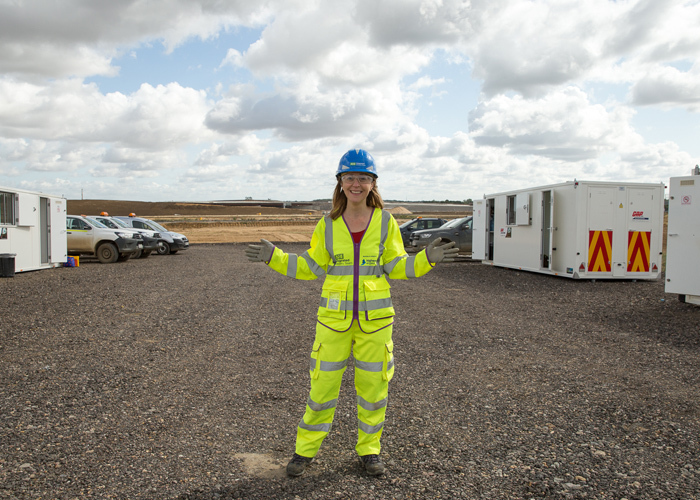 The safety goggles, hard hat, high-vis trousers and jacket, gloves and boots were quite a different look from my usual office attire. It goes without saying that PPE is necessary. There are the manual aspects of archaeology which include using tools such as a wheelbarrow, shovel, trowel and mattock – which is a hand tool for digging and chopping and looks similar to a pickaxe. Weather conditions can also increase the risks of incidents from digging in hard stony ground, to slippery surfaces in the rain. Each morning, along with the other volunteers, I received a safety briefing to highlight any potential issues. I quickly became accustomed to my new look and knowing that I was properly protected, meant that I could concentrate on getting stuck into the tasks at hand, and that everyone else on site could certainly see me coming! Over the five weeks, I gained such a varied experience. From learning the basics of excavation and recording of features, to digital surveying and a trip to the nearby finds processing centre, every day on site was a new adventure. Digital surveying was really interesting, albeit very different from the digital work that I’m used to! 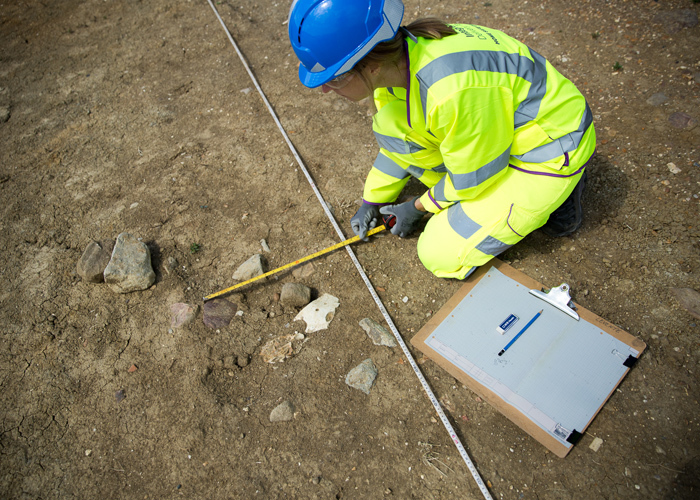 Archaeologists use all kinds of kit like Robotic Total Stations, GPS (Global Positioning Systems) and VRS (Virtual Reference Stations) to record archaeology in a 3D space, so that this information is still accessible to future researchers once the site has been excavated. Recording archaeological features using a drawing board, pencil and drawing film, while sitting outdoors proved to be a really therapeutic experience and a welcome change from the computer in the office. However my all-time favourite part of my time on site has to be digging. 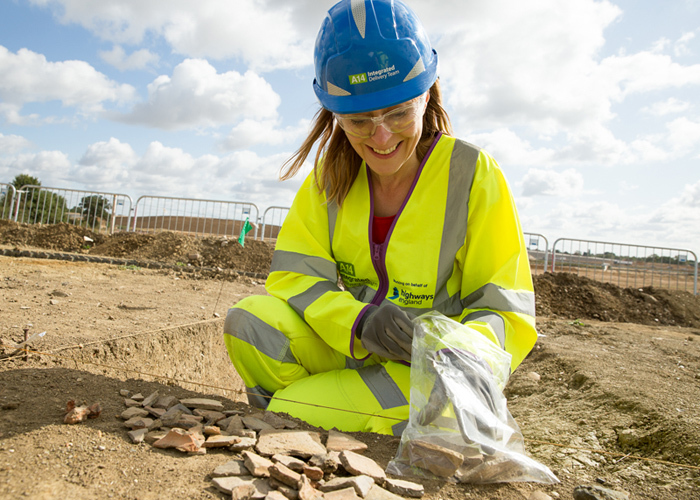 Whilst quite literally tonnes of pottery (5.2 so far) have been found on the A14 excavations, there is nothing like finding your first piece of medieval pottery and imaging who may have last held it, or drank from it! 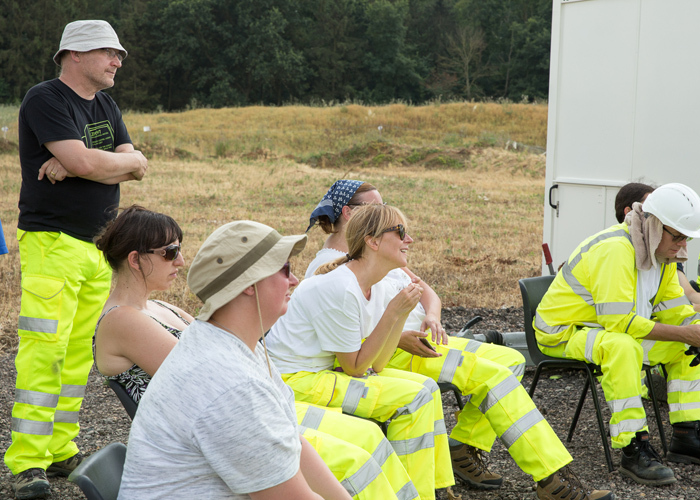 One of the most valuable aspects overall has been receiving expert guidance from the team at MOLA Headland Infrastructure, including daily talks on pottery, finds processing and photography. I’ve also made new friends on the dig from my local community. I think you could safely refer to us as ‘archaeology enthusiasts’ and we are already planning a get together down the local pub to chat about our shared experiences. Thank you to MOLA Headland Infrastructure and the A14 Integrated Delivery Team for this fantastic experience.